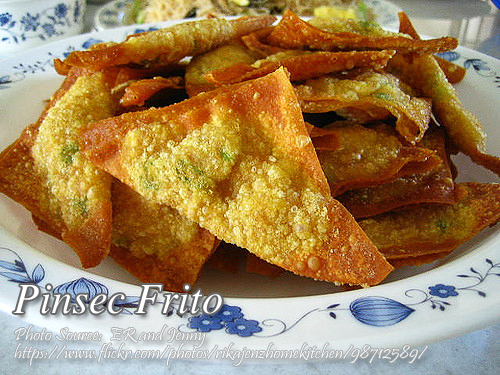 Pinsec prito or pinsec frito is very similar to the popular siomai, the filling and the wanton wrapper. The only difference is the shape of pinsec frito is usually triangular instead of the round shaped siomai. Actually this is the Pinoy version of fried wonton. There can be also differences of ingredients used on the filling. Some use pork, chicken, crab meat, shrimp or beef. This pinsec frito recipe I have here use beef and shrimp plus the extenders, mexican turnip (or jicama) and carrots for the filling. To make pinsec prito; Mix thoroughly all ingredients except wanton wrapper and oil for deep frying. Place 1/2 tsp. mixture into one corner of wrapper, moisten edge of wrapper by dipping your finger in water and fold it to seal forming a triangle. Fry in deep fat until golden brown. Serve with sweet-sour sauce. For the complete recipe and exact measurement of ingredients, continue reading. Mix thoroughly all ingredients except wanton wrapper and oil for deep frying. Place ½ tsp. mixture into one corner of wrapper, moisten edge of wrapper by dipping your finger in water and fold it to seal forming a triangle. Fry in deep fat until golden brown. Serve with sweet-sour sauce. Serve hot. Good for 6 persons.